What is your favorite day of the week? Maybe Friday, with the anticipation (or relief) of the weekend approaching? Monday perhaps, with all its promise for a new and hopefully better week ahead? Or Saturday, with the possibility of freedom to do as you please without being ruled by an alarm clock or schedule? Did you favor a certain day as a child? And if so, do you find the day(s) to be the same or different day now all these years later? Sundays were like that for me growing up. There was a routine to Sundays that I came to know and depend on. I look back on it now almost enviously, wishing I could emulate it for my own family. Like many families, Sunday mornings meant church. My mom was a faithful participant at the 10am service at our local Episcopal Church. When I was young I went with her; when I was older I stayed home and gratefully slept in. The vibration of garage door rising would shake my room a bit as her car pulled out always by 9:45am. By 12:30pm when it popped up again, I would be downstairs in the kitchen, casually dressed and seated around the table with my father, the Sunday paper disseminated into all its many sections around us. There were my older teenage years where I had nothing to say to my dad and welcomed the distraction of the newsprint. There were later years where he and I got nothing read, our in-depth conversations keeping us from doing more than glancing at a headline. The atmosphere would always change as soon as my mom’s heels clicked on the linoleum floor. An apron was whisked on over her church clothes. Brunch was soon served – casual, no fuss, but filling and comforting in its own way. The smell of maple syrup always remained in the air long after the dishes were done, a comforting reminder that stayed with me long into the afternoon. My parents would then start up their crossword puzzle routine – my mom always asking my dad if he had finished the thing up for her while she was gone, knowing quite well he would never dare. Soon she was caught up in 14 across and 23 down. My dad remained there at the table, available to assist as needed – and although she held the pen, it was somehow a shared activity – just as some couples share a decadent dessert or a good bottle of wine. There was a quiet rhythm to the day, one I find so lacking in my life now as a mom. There is something about “…lingering at the table” that is so comforting, so soothing in this current, busy time. How do you create that for yourself, your children, this Zen Mama Wannabe wonders while trying to juggle fall ball games and birthday parties and friend and family get-togethers? Is it balance I seek, or merely a return to a time that was far more simple – where cell phones didn’t ring, or email programs beep and the phrase “24-7” didn’t exist. I so long for the time to sip coffee while sitting down (think I got to do that once last week) and peruse the Sunday paper at leisure. To not feel ruled by the clock and the constant shout out of how much longer we have until we’re leaving, heading out the door for yet the next event or activity. Yes, I wonder, what will MY children remember? What about yours? 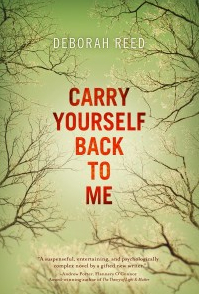 This post was inspired by Deborah Reed’s debut novel Carry Yourself Back to Me which follows heartbroken singer-songwriter Annie Walsh as she digs into the past to exonerate her brother from murder. As a member of From Left to Write book club, I received a copy of this book for review. You can read other members posts inspired by Carry Yourself Back to Me on book club day, October 4 at From Left to Write. Surprisingly helpful thank you, I do think your trusty followers may perhaps want a good deal more well written articles along these lines maintain the excellent hard work. I love that you included the quotes about the Sundays. There’s a sad song by Lucinda Williams called ” I can’t seem to make it through Sunday.” I didn’t include it in my playlist but I guess I should have. The scenes I wrote for the Sunday’s in the book were similar scenes of my own childhood that I cherished, whether they happened on a Sunday or not. It was just the time spent together that was so meaningful to me, and for most people Sunday is when that takes place. I recently bought a new dining room table for the sole purpose of creating a space that is extremely inviting. A place where everyone wants to gather for hours at a time. So far it’s working. Thank you so much for posting this and for reading the novel. up all ovesr the internet without my agreement. Do you know any techniques to help stkp content from being ripped off? That is a really good tip especially to those neww to the blogosphere. Short but very accurate information… Many thanks ffor shaing this one. I’m amazed, I must say. Rarely ddo I encounter a blg that’s both educative and engaging, and let me tell you, you’ve hit the nail on the head. essay writing help help essay writing. , writing essay help.